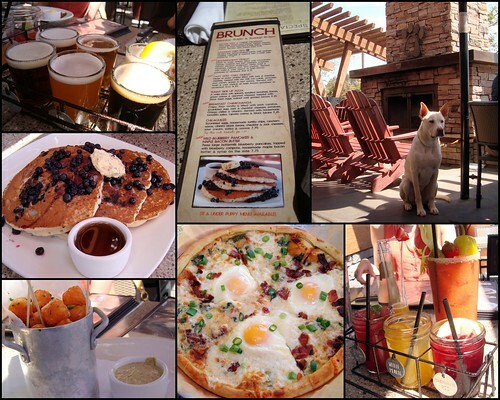 This past Sunday I was invited to check out the new brunch menu @ Lazy Dog Café. 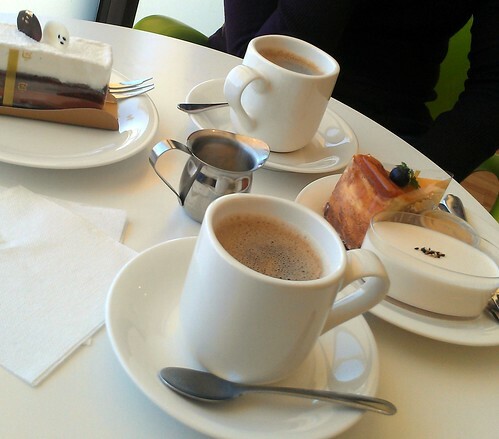 Since it's all the way out in Torrance, I decided to make a daytrip out of it and check out a few to-try spots (and revisit some longtime favorites) in one fell swoop. 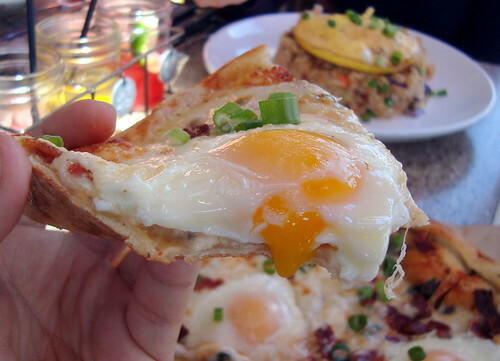 Even though we were supposed to try the new items, the thing that caught my eye the most was the Sunny Side Up Pizza, so that's what I ordered. And I'm thankful for it -- I liked the best out of the four brunch items I tried (ok, five if you count the sweet potato tater tots with roasted chili aioli -- also delicious!) The crust was crispy yet substantial, topped with just the right amount of garlicky oil, stretchy-gooey cheeses, sundried tomato, bacon and still-runny eggs (and I daresay a vegetarian can get just as much pleasure omitting the bacon portion of this pie.) And one pizza proves worthy enough for two meals, I wound up doggy-bagging half of it! 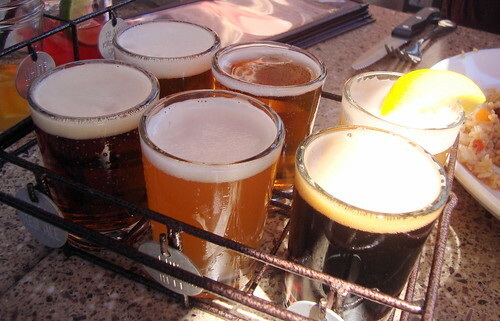 Also impressive is the Lazy Dog line of beers, most of which are brewed by Firestone Walker Company. Fiona and I shared their sampler of six, and I personally loved their red beer the best (so much that I got another taster glass of it!) If beer isn't your thing, other worthwhile brunchy drinks include their sangria trio, bacon bloody mary & of course, mimosas! Even though we had brunchy desserts in the form of blueberry pancakes with maple-bacon butter, Fiona and I couldn't resist the opportunity to visit Patisserie Chantilly -- one of our favorite bakeries specializing in Japanese-French pastries (generally more delicate in texture, less sweet, and often with East Asian flavor influences -- think green tea mousse cakes and black sesame cream puffs.) Of course, don't do what I did and take a photo of the beautiful pastry case, turns out it wasn't allowed and I got scolded for it--you can check out their pretty creations @ their web gallery. 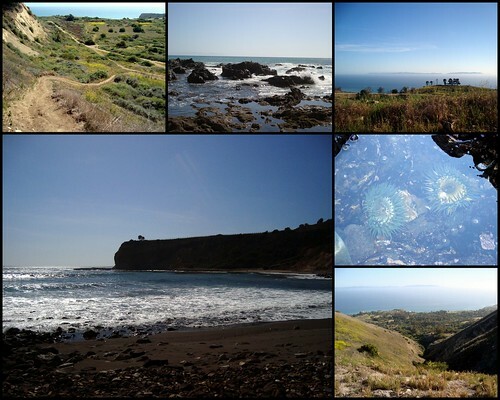 ...and it did indeed made for a gorgeous stroll, even if I got myself a little lost on all those forked trails -- turning an intended two hour excursion into a three-and-a-half hour affair. 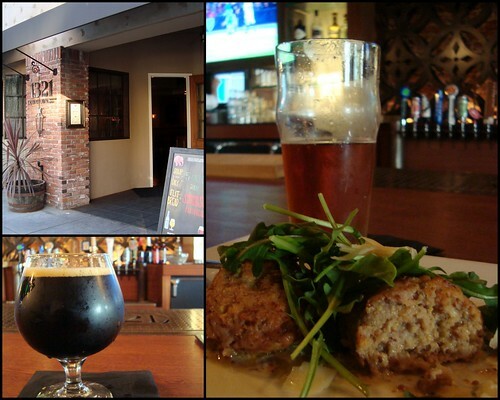 Parched and possibly overheated, I opted to cool down at 1321 Downtown Taproom Bistro in - big surprise - Downtown Torrance. 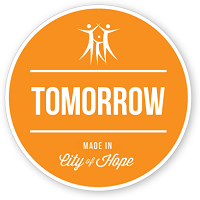 And lucky for me that I made it in time for their happy hour (4-7p daily), with most beers on tap for $2 off the usual price and about a dozen starter dishes that are discounted too. Since I'm in the South Bay, I paid a little geographical homage with Strand's Beach House Ale, a slightly hoppy amber that's plenty refreshing. To help wash that down, I tried their Downtown Meatballs, a fluffy and flavorful veal-pork blend that's served with some zesty Creole mustard, peppery arugula and Asiago shavings. A nice substantial, but not too heavy, bite to go with the beer. 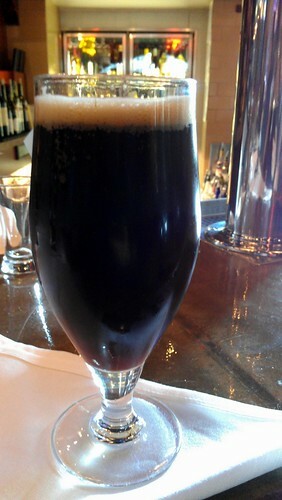 And for good hydration & caffeine measure, I followed up with a goblet of Bootlegger's Black Phoenix. 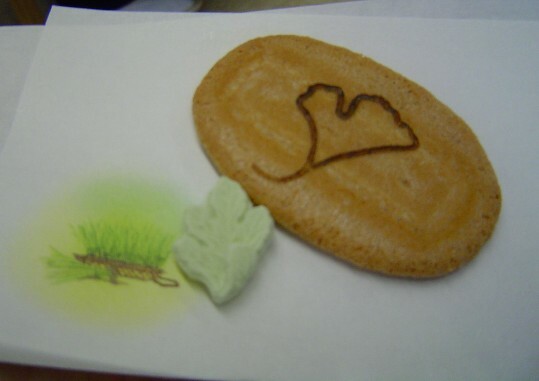 For my final stop of the night, I opted for another longtime Torrance treasure: Ichimi Ann Bamboo Garden in the Rolling Hills Plaza, well-known for their premium soba and udon noodles and above-average tempura. 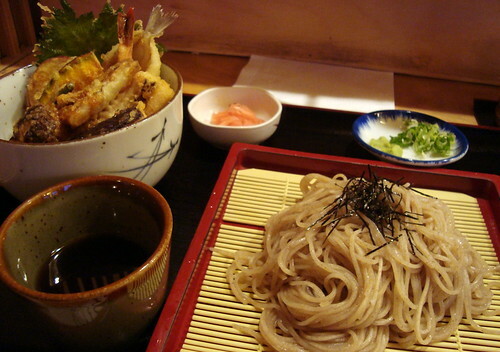 So it's little surprise that I got the zaru soba & tempuradon combo. And it was as sublimely delicious as I remembered. 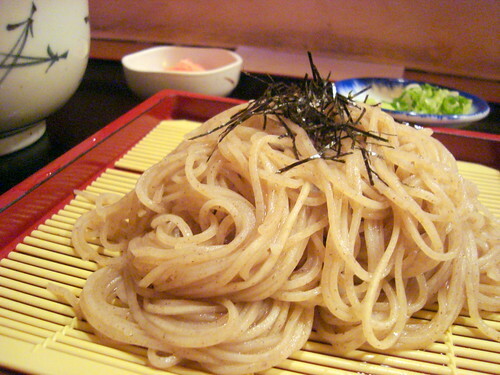 From the toothsome, slightly nutty flavored noodles, mildly accented with green onions, fresh wasabi and a soy/dashi-based dipping sauce. 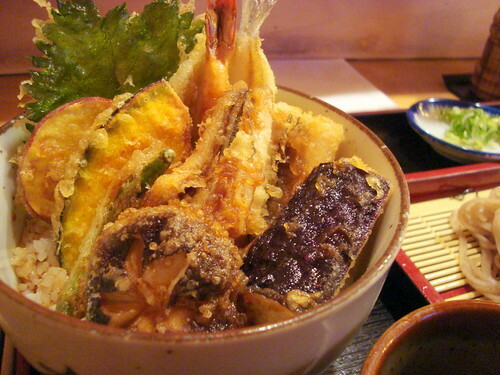 To the impeccably light and crispy tempura dressed with a drizzle of delicate teriyaki sauce. 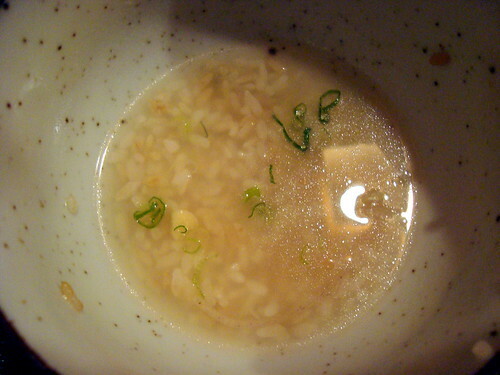 Finishing up by turning the remaining leftover rice into a porridge with the water that the soba's been cooked in. And that wrapped up for a day & early evening well spent (and well fed) -- though it left me wondering why I don't come to Torrance more frequently. As it stands, I already can't wait to return to this area and check out more spots, as well as giving another go-around for all of the above. Physician Marketing: "Grenadian nutmeg is freshly grated into dark chocolate before roasted walnuts and dried organic bananas from the big island of Hawaii are combined to create the Banana Victoria Bar. The flavors are reminiscent of pain d'epices, a French spice bread often served at the holidays. But, you will likely become so enchanted at first bite, you will be indulging in this bar year round." Patient's Notes: An evolved version of their (now discontinued) Organic Habana bar, I thoroughly enjoyed the flavor & aroma of this one - a nuanced mix of banana bread and gingerbread - against a backdrop of smooth, rich dark chocolate and the occasional pieces of nuts and bananas. The predecessor's flavor profile (chocolate with plantains) was enjoyable, but the nutmeg & walnuts definitely kicked it up a notch. My only gripe is that the banana pieces has a tendency to become taffy-like and stick to your teeth if you just let the chocolate melt on your tongue. And picking through my teeth for stray sticky bits isn't exactly something I want to do during my session. Likelihood of Rebooking An Appointment: 8/10, the flavor is lovely but it's a bit of a hassle to deal with the banana pieces; there are other Vosges' bars that I enjoy more without the mess factor. 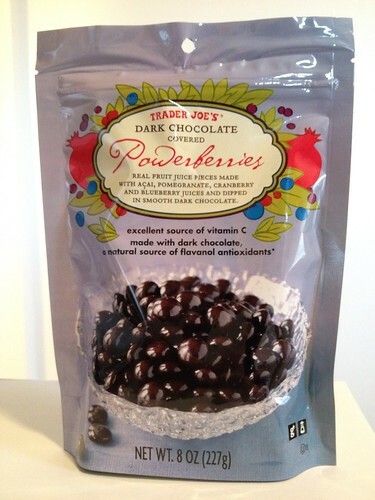 Physician Marketing: "Our dark chocolate covered powerberries start with centers of real fruit juice. Pieces made from the juices of acai, pomegranate, cranberry and blueberry, all known for their nautural powerhouse antioxidants and other nutrients. They are then enveloped in smooth dark chocolate, creating a flavorful confection that is sweet, tart and rich taste sensation all at once." Oh yeah, it's also best to just chew into these choco-berry bits - it was a tad bit waxy when I tried to let it melt in my mouth. Likelihood of Rebooking an Appointment: 9/10, yes - it has an overhyped 'health halo' but they're not that pricey and tasty overall. Physician Marketing: "An Oatmeal Stout brewed with lactose (milk sugar), oats, three different types of chocolate added at three different stages of the brewing process, and a custom blend of Brazilian and Nicaraguan coffees from Costa Mesa's Portola Coffee Lab. Medium-bodied, roasty and chocolatey, finishing very smooth. (6.8% ABV)"
Patient Notes: Every now and again, I can go for a drinkable session -- and the Mocha Stout definitely fits that bill of getting me buzzed in more ways than one. This brew was a wonderful balance of contradictions, infused with deep chocolate and coffee flavors without being bitter at all, and a texture that tastes smooth and rich without being particularly hefty or heavy. And from taste alone I wouldn't have guessed it was almost 7% ABV, making this a dangerous appointment indeed.